Two years ago, I posted about the online streaming music battle and declared Pandora the winner (And the winner is… PANDORA!) Well, some new players have come on the scene since then so it is time to once again analyze what is going on in that space and of course, give my choice for the one that works best for me. I know there are more, but these are the ones I am using and the only ones I will comment on. When I say streaming radio, I am not talking about terrestrial radio station feeds redirected to the internet. I am not interested in traditional radio. Pandora – It won my last comparison mainly because Last.FM started charging for the app version. Not much has changed with Pandora. It still allows you to stream on computer or via app. The thing that has added to my personal use is its integration with my car. Now when I connect my iPhone to the stereo in my Honda Civic, it recognizes Pandora, allows me to change my stations, click LICK or DISLIKE etc. It still integrates with my Last.FM scrobbing ONLY when connected via computer – that is the biggest downside to me. Spotify – When this came onto the scene it appeared to be a big challenge and it absolutely rocks in the desktop world. (I am listening to it while writing this post.) It allows me to play entire albums, create playlists, create genre specific stations, even catalog my own music etc. – all the cool stuff. The big downside is that Spotify is absolutely worthless as an app. You must pay to use the features. It does scrobble plays to Last.FM for desktop plays. iTunes – yes, this is the big new player on the block. I have only toyed with it a couple of times since I got it the iOS 7 update, but I already found some flaws. As a streaming station via my phone, it seems to cut out more… not sure if that is a buffering issue – but I assume that will be fixed in time. It is DANGEROUSLY easy to purchase songs with a simple click…. that could get me into trouble fast. I have no clue if it is going to scrobble plays to Last.FM anytime soon, but I kinda doubt it. Last.FM – as last time, it only lacks a free app version of the streaming radio to be my choice. Color me cheap, but I am just not going to pay to stream radio. Didn’t jump on the XM/Sirius bandwagon and not about to jump on this one. It is the only solution I have for tracking (scrobbling) what I play and the nerd in me just loves to see my “charts” and track my listening trends over time. So who is the new winner? 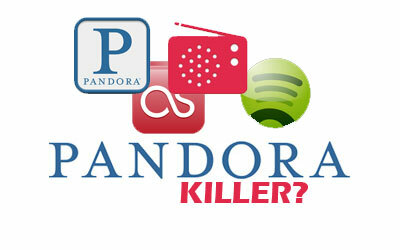 Is iTunes streaming radio the Pandora-killer? I am not so sure. Apple certainly has the muscle to do it, but I just don’t see them going that direction. Right now my choice for desktop is Spotify and my choice for app use is still Pandora.